Syringomyelia is a dreaded hereditary disease which affects small breeds, especially Cavalier King Charles Spaniels and is also known as “neck-scratcher’s disease” because excessive scratching in the air, near the neck, is a common symptom. The diseases causes significant pain to the animal, especially around the neck and can be very disabling and distressing for both pet and owner involved. In a normal dog, the cerebrospinal fluid flow (CSF) around the brain shunts back and forth with thearterial pulse. However, if there is a blockage or obstruction to the cerebrospinal fluid flow then a pressure wave will be transmitted down the spinal cord and cause the formation of one or more cavities or ‘syrinxes’. The most common cause of obstruction is when the cerebellum at the back of the brain is pushed out of the skull because there is not enough space within the occipital bone – a common phenomenon in small breeds and especially in Cavalier King Charles Spaniels, where it is estimated that at least 50% of the breed are affected. Aside from the common symptom of “neck-scratching” and obvious signs of pain, especially around the neck, syringomyelia can be confirmed by an magnetic resonance imaging (MRI) scan as pockets of fluid will show up in the spinal cord. Note that it is important to have the MRI images interpreted by Diplomate-level radiologists, neurologists and veterinary surgeons with recognised expertise. Not all dogs with syringomyelia will present with clinical signs but most dogs will show symptoms of the disease by three years of age. These include restlessness, increasing reluctance to exercise, difficulty moving up or down furniture and uncoordinated movements in the early stages, followed by an uncontrollable urge to scratch the neck area and shoulders, together with a hypersensitivity of the neck area. As the diseases progresses, there might be severe pain around the shoulders, neck and head causing the dog to scream and yelp. More serious cases result in portions of the spinal cord being destroyed, so that the dog contorts his neck and cannot eat or sleep unless its head is held high. In addition, the legs will become progressively weaker and walking becomes increasingly difficult, with some dogs deteriorating to the point of paralysis. The rate of progression varies between individuals – in some, the pain becomes severely disabling and distressing whilst in others, the condition can be managed by medical or surgical intervention. As with other hereditary diseases, all breeding stock should be screened and any dog with suspected syringomyelia should not be bred from. Prospective owners of small breeds should check that they are buying from a reputable breeder who is aware of and participates in the health screenings. Although dogs can be screened as early as 6 months old, it is not recommended to test the dog until it is at least 2 and a half years old (or to retest after this time) as many dos do not develop or show symptoms of the disease until later in life but can still pass on the defective genes to their offspring. Are Purebred Show Dogs Unhealthy?
" 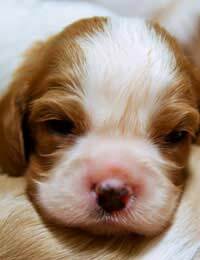 .... is a dreaded hereditary disease which affects small breeds, especially Cavalier King Charles Spaniels" Is not completely the truth. The serious CKCS breeders are the only ones who have MRI scanned a great number of dogs worldwide. Let all the breeders of other breeds scan their dogs first, before saying this. Be careful with too early conclusions. There are allready breeds with a higher percentage.